Patrick McCullough is an Oakland hero. 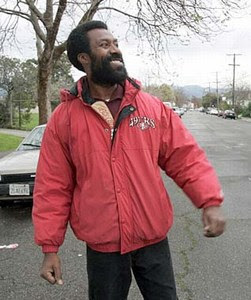 In 2005, he stood up to attack by drug dealers -- a gang that he reported to Oakland police, but who were still at large at the time. In defending himself against the gang, Pat shot and wounded one of the gang members. Mr. McCullough was found to have been acting to defend himself, and thus the D.A. did not press charges. Pat is one who was and is trying to take back his neighborhood. The ultimate action is the one he's taking today: running for Oakland City Council. This blog post in an endorsement of an Oaklander who can and has made a difference. It's not a matter of being against the incumbent Jane Brunner, but for a remarkable and remarkably brave person in Pat McCullough. A person with a resolve and will to stay in Oakland and help make it better. Patrick McCullough, the north Oakland resident who stood up to street thugs, has triumphed. The thugs were used to loitering on his front yard. In a confrontation on Feb. 18, 2005, one of them reached for a gun. Navy vet McCullough, drawing the handgun he had taken to carrying for protection, shot in self-defense, hitting the thug in the arm. A year later, the attacking thug and his family have moved out of Oakland. The street is safe enough for McCullough and his neighbors to walk peacefully. Neighbors filed suit in small claims court against the owner of a drug house and won a $45,000 judgment. The owner sold the house and moved. Another house owner stopped dealers from using her property because neighbors were ready to take similar court action. Bushrod Park has been reclaimed for children and families, ousting the drug dealers. As a resident of the block for thirty years said, "Patrick McCullough is the best thing that ever happened for this block." John Russo and Matt Gonzalez After "Network"